I wrote this for Poetry Potluck… Please do check out the other amazing creative writes. This entry was posted on November 1, 2010 at 2:47 pm and is filed under Fiction, POETRY. You can follow any responses to this entry through the RSS 2.0 feed. You can leave a response, or trackback from your own site. We don’t celebrate halloween here but if we were to do so I could always go as myself … no monster mask required! Where I live it’s so dark in the evening that no one stops by for Halloween…perhaps the howling coyotes may also discourage visits. Happy Halloween! The spirit of Halloween summed up. Good job. Happy Halloween. Wonderful poem Amanda! You really made me nostalgic about my childhood halloween days. Liked it so much.. and great image… too. Great halloween poem – and your pics are awesome! Fabulous Halloween poem! 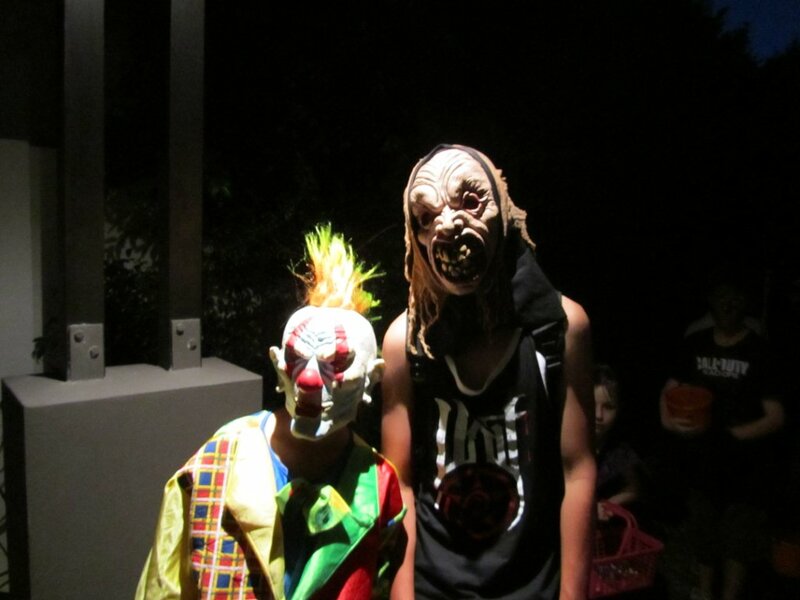 You had some scary creatures show up at your door, great pics! perfect, kids start to knock my door at 5pm. by 9pm, all candies are out. non stopping flows of kids and their parents. Amanda this is a great halloween poem thanks for sharing and those pictures are GREAT!!! Great post, Amanda! Your muse is returning! That’s about how many kids we had total this year. It was very slow, but the ones that DID show up got LOTS of goodies! Nice job capturing the Halloween spirit for Microfiction Monday, Buttercup! hoho halloween oh! i am scared oh! just adorable. loved reading it. That has certainly summed up halloween for me! Good as always, babe. Love it! Another great one, Amanda! I liked the poem and loved the photos. A baby in any sort of costume is always gut bustingly funny and jaw droppingly cute. My nephew went as a baby monkey this year, he’s just now mastering walking. Since so many of us on this island are health freaks (!) and we don’t subscribe to pouring more sugar in the mouths of living beings, community parties are taking over from the door to door event. It’s safer, healthier and appreciated by one and all. Having said that, anyone care for about 2 dozen packages of corn cheezies – which are 14% fat…ERG! My thoughts are very much with you, Amanda. Love the poem. So much fun! Very sweet. I had no trick or treaters this year. Most of the young kinds on my street are with refugee families from Burma and Togo and Somalia, as well as other places, and I don’t think they would go door to door asking for candy even if they understood it. However, I work in social services, and Friday afternoon was the big trick or treating for the 25 kids at the residence hall at our campus – they go among the administrative offices, and we decorate and have candy on our desks for them. Fantastic Buttercup! 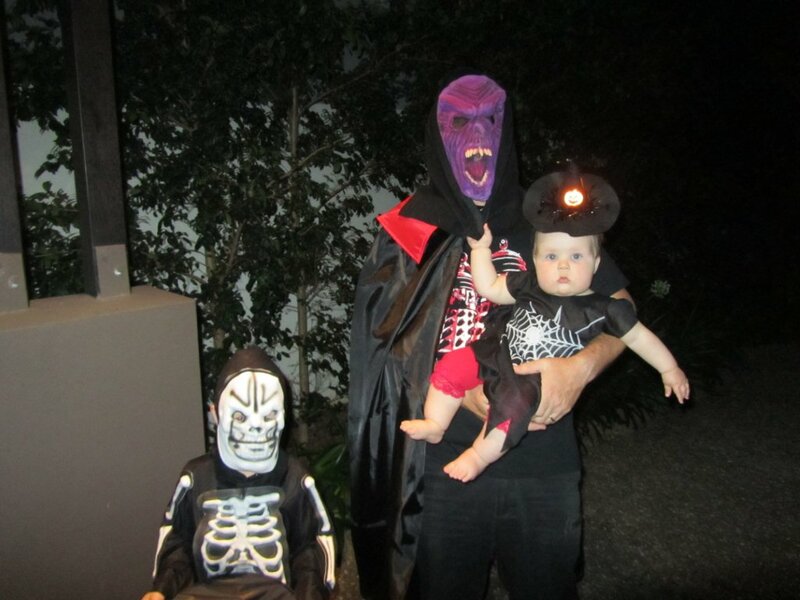 It also looks like you had a blast with the kids…You didn’t try to scare any kiddies did you? Hope you did it well if you did! We had fun too… take care! Loved the poem and the pictures! Excellent poem! Happy belated Halloween! Your poem brought a flasf of images racing in my head…. from last year and the year before that…. just received the news- congrats on your BIG win haha! cheers amanda! Scarily stunning, Amanda!! Love that lightning! Your presence adds light to our space, keep shining! poems surrounding occasions can fall flat at times, but not this poem! It sparks and incites the mind…as do the images! i will miss you when you leave for vacation! Thanks! And thank you so much for your work on Poetry Potluck. This was a nice one to read- always doing it so differently and beautifully.. Hope you are doing well..